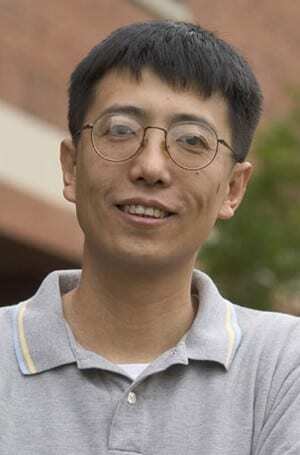 Haiqing Zhao is a professor of biology whose primary research interest is in the function and development of olfactory sensory neurons. He received his BA from Peking University and his PhD from Yale University, and did his postdoctoral work at Johns Hopkins University. Humans and animals rely on sensory receptor cells to communicate with the environment. Sensory receptor cells transform environmental cues, such as light and odors, into neural electrical signals for the nervous system to process. Understanding how sensory receptor cells respond to sensory cues is essential to understanding perception and behavior as well as illness and disability in sensory systems. Our laboratory is interested in the first step of olfaction—olfactory signal transduction, the process by which olfactory sensory neurons transform information of odorous chemicals into membrane potential changes. 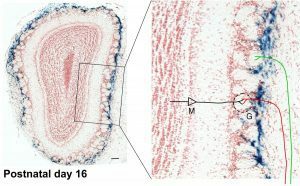 In vertebrates, olfactory signal transduction takes place in olfactory cilia, which extend from the tip of the olfactory sensory neuron dendrite into the mucus that covers the nasal epithelium. 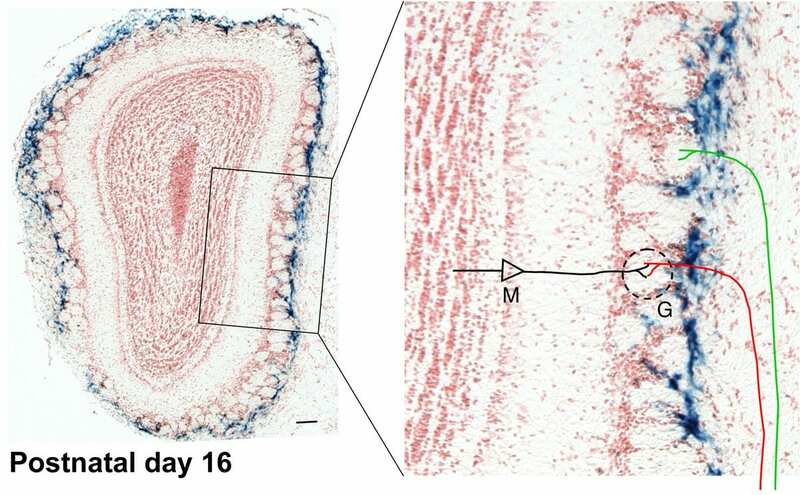 In most olfactory sensory neurons, transduction is achieved through a G protein-coupled, cyclic AMP-mediated signaling pathway, starting with the binding of an odorous chemical to its receptor protein. 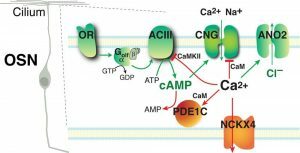 Ca2+ plays a key role in mediating and regulating olfactory transduction. On the one hand, Ca2+ amplifies OSN depolarization by activating the Cl- channel ANO2; on the other hand, it negatively regulates the transduction pathway to cause adaptation—a phenomenon manifested as a reduced sensitivity upon sustained or repeated odor exposure. Our current research focuses on identifying proteins that partake in or regulate the transduction process and on understanding how calcium-dependent regulatory events influence the sensitivity and response kinetics of olfactory sensory neurons. OR, odorant receptor; Golfα, olfactory G protein α subunit; ACIII, adenylyl cyclase III; CNG, olfactory cyclic nucleotide-gated cation channel; ANO2, anoctamin-2, Ca2+-activated chloride channel; PDE1C, phosphodiesterase 1C; NCKX4, the potassium-dependent Na+/Ca2+ exchanger-4. Green arrows indicate activation steps; red T’s or arrows indicate mechanisms for termination and adaptation. We are also interested in the development and regeneration of olfactory sensory neurons. In mammals, each olfactory sensory neuron expresses only one allele of over 1,000 odorant receptor genes. Olfactory sensory neurons expressing the same odorant receptor, though randomly dispersed in a broad area of the olfactory epithelium, project axons to the same locations in the olfactory bulb of the brain. Further, olfactory sensory neurons have a relatively short life span and are susceptible to damage caused by environmental factors. The neuronal population is continuously renewed throughout life and maintains a conserved connection pattern to the olfactory bulb. Our current research explores mechanisms that control their precise axonal targeting and mechanisms that regulate olfactory sensory neuron differentiation and odorant receptor expression. The picture shows a staining (blue color) for expression of a reporter protein β-galactosidase (β-gal) in an olfactory bulb section of a transgenic mouse at the age of postnatal-day 16. β-gal expression reports the nuclear β-catenin activity, which is usually caused by activation of the canonical Wnt signaling pathway. In the enlargement is an illustration of olfactory sensory neuron axons (red and green trace) innervating glomeruli (G) and making synaptic connections with the dendrite of the olfactory bulb projection neurons, mitral cells (M). The staining reveals a layer of β-gal positive cells located at the interface between the olfactory sensory neuron axons and their final target, the glomeruli. We found that β-gal expression peaks at the developmental period when olfactory sensory neuron axons innervate glomeruli. β-gal expression diminishes in adulthood, but reappears when experimentally induced massive regeneration of olfactory sensory neurons occurs. The spatial and temporal characteristics of these cells suggest a role for these cells in olfactory sensory neuron axonal targeting (T Booker-Dwyer et al. Dev Neurobio, 2008). Our experimental methods include gene-targeting in mice, molecular biological and biochemical assays, genomics and proteomics, histological characterizations, electrophysiological recordings, and behavioral tests. KD Cygnar, SE Collins, C Ferguson, C Bodkin-Clarke & H Zhao (2012) Phosphorylation of Adenylyl Cyclase III at serine1076 does not attenuate olfactory response in mice. J. Neurosci 32(42):14557-62. AB Stephan, S Tobochnik, M Dibattista, J Reisert, and H Zhao (2011) The Na+/Ca2+ exchanger NCKX4 governs termination and adaptation of the mammalian olfactory response. Nature Neuroscience15(1):131-7. AB Stephan, EY Shum, S Hirsh, KD Cygnar, J Reisert, and H Zhao (2009) ANO2 is the cilial calcium-activated chloride channel that may mediate olfactory amplification. Proc Natl Acad Sci U S A.106(28):11776-81. KD Cygnar and H Zhao (2009) Phosphodiesterase 1C is dispensable for rapid response termination of olfactory sensory neurons. Nature Neuroscience 12(4):454-62. Y Song, KD. Cygnar, B Sagdullaev, M Valley, S Hirsh, A Stephan, J Reisert, H Zhao (2008) Ca2+/calmodulin-mediated fast desensitization by the B1b subunit of the CNG channel affects response termination but not sensitivity to recurring stimulation in olfactory sensory neurons. Neuron 58(3):374-86. T Booker-Dwyer, S Hirsh, and H Zhao (2008) A unique cell population in the mouse olfactory bulb displays nuclear beta-catenin signaling during development and olfactory sensory neuron regeneration.Developmental Neurobiology 68(7):859-69. H Zhao and RR Reed (2001) X inactivation of the OCNC1 channel gene reveals a role for activity-dependent competition in the olfactory system. Cell 104, 651-660. H Zhao, L Ivic, JM Otaki, M Hashimoto, K Mikoshoba, and S Firestein (1998) Functional expression of a mammalian odorant receptor. Science 279, 237-242.